WrestleMania XXV (also known as "The 25th Anniversary of WrestleMania") was a professional wrestling pay-per-view event produced by World Wrestling Entertainment (WWE), which took place on April 5, 2009 at Reliant Stadium in Houston, Texas. The event was the 25th event produced under the WrestleMania name and featured wrestlers from all three WWE brands: Raw, SmackDown, and ECW. It was the second WrestleMania to be held in Houston, with the first being WrestleMania X-Seven at the Reliant Astrodome, which was held in 2001. Eight matches were held on the event's card, which featured a supercard, a scheduling of more than one main bout. The first of these matches was a singles match for the WWE Championship that featured the champion, Triple H, defeating Randy Orton to retain the title. The second was a Triple Threat match for the World Heavyweight Championship, which saw John Cena defeat the champion, Edge, the other participant in the match, The Big Show, to win the championship. Featured matches on the undercard included The Undertaker versus Shawn Michaels, Jeff Hardy versus Matt Hardy in an Extreme Rules match, Chris Jericho versus the team of Roddy Piper, Ricky Steamboat and Jimmy Snuka, and the annual Money in the Bank ladder match. Tickets for the event commenced sale to the public on November 8, 2008. For the third consecutive year, WrestleMania broke the record for the highest-grossing pay-per-view in WWE history, grossing US$6.9 million in ticket sales, which included fans from all 50 U.S. states, 24 countries, and seven Canadian provinces. 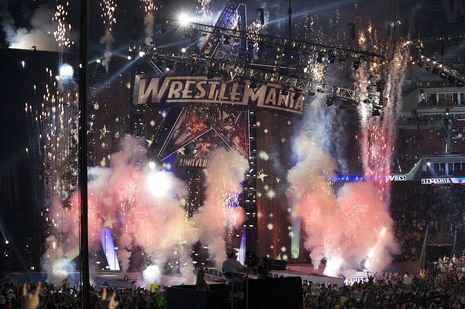 Approximately 960,000 people ordered WrestleMania XXV, grossing $21.0 million in revenue. This amount was less than the 1,058,000 buys that WrestleMania XXIV achieved.